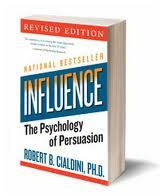 I had the pleasure this past week to read Robert Cialdini's "The Psychology Of Persuasion." It is the compilation of Cialdini's life work where he has studied why people make the decision to do things. It focuses on business, sales, marketing, relationships, and every day life decisions that take place in the world around us every day (most that we rarely notice or think about). While some of the decisions are rational, other are completely irrational and Cialdini describes why those decisions are made, how you can avoid making them when they arrive, and how you can use the power of Influence to motivate others around you. While he does not specifically reference the financial markets you will see that many of the topics translate seamlessly into the irrationality occurring both around the world today and throughout history. I will reference specific chapters of the book in the future when I discuss certain psychological occurrences as they come in real time. The following is a brief illustrated view of just a few of the topics discussed in the book, which I highly recommend you put on your spring and summer reading list.